Is your home making you sick? Many people will feel the onset of a respiratory infection come upon them, puzzled by the reason for this sudden health ailment, and it could be what lies within the walls of your home that is contributing to your poor health. Could it be mold? 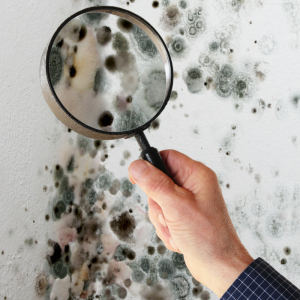 Do you know how to detect mold in your home? Mold is a silent invader, that creeps into your home, tainting the air you breathe in and leading to an array of health issues. According to the Environmental Protection Agency, all types of mold have the potential to cause ill health and lead to a variety of symptoms. As it has become a more prevalent topic when discussing health-related issues, links to mold-related illnesses have come to light such as Toxic Mold Syndrome. Toxic Mold Syndrome (or TMS for short) is a reaction to a mold species that affect a person’s health tremendously. These types are referred to as “toxic mold”, making it very important to learn how to detect mold in your home. To learn how to detect mold in your home, you must do thorough research regarding how to spot symptoms of mold in home. Toxic mold can be a misleading term used when talking about the impact of different forms of mold. Any type can be potentially dangerous to your health, depending on the amount present in the environment. However, there are forms of mold called “toxigenic” that under specific situations can produce small molecular toxins, known as mycotoxins. These mycotoxins can spread into your air by way of spores and these toxins are the culprits of lasting health problems if exposed to and ingested for a long period of time. Two forms of mold that have been classified as “toxic mold” in homes and that should be cautiously monitored for are Stachybotrys Chartarum and Aspergillis. Keep reading to find out more about both of these molds, what toxic mold syndrome is, symptoms of mold in home, and, most importantly, how to detect mold in your home. Black Mold, also known as Stachybotrys Chartarum is a highly potent and toxic form that can grow in your home. This toxigenic mold has a greenish-black appearance that typically grows in moist environments that it feeds on. The truly dangerous aspect of black mold is the mycotoxins that are released from it. Mycotoxins can become a key component in the development of health-related issues, once you breathe in these toxins it can lead to serious symptoms. Detecting mold in your home is key to a healthy life. The mycotoxins produced by Stachybotrys chartarum are powerful and can especially cause severe irritation. Another form of potentially “toxic mold” is Aspergillis. This form, although less “toxic” than the dreaded black mold, can also be a source of major health issues when breathed in for a long period of time. Aspergillis is a far more common form in homes, making it a serious type to be on the lookout for in your personal environment. The mycotoxins that are released from Aspergillis have a tendency to invade people’s lungs and other parts of your body including your sinuses. When Aspergillis starts releasing spores into the environment it than can create a condition called Aspergillosis to people exposed to the mycotoxins and spores released. Aspergillosis is an infection developed from Aspergillis that lives inside your home, and for those that suffer from weakened immune systems and lung disease are at a higher risk of developing health problems caused by this form of mold. While this is a lot of information, it is important to know the various types of molds, what toxic mold syndrome is, and how to detect mold in your home so you can take proper action. Learning how to detect mold in your home can be one of the biggest challenges when dealing with it in your personal environment. It can be found almost anywhere with its ability to grow on virtually anything, provided there is moisture and oxygen in the environment. 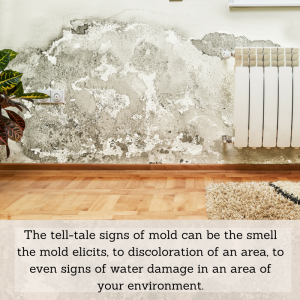 The tell-tale signs of mold can be the smell it elicits, to discoloration of an area, to even signs of water damage in an area of your environment, these being some of the most common symptoms of mold in home. 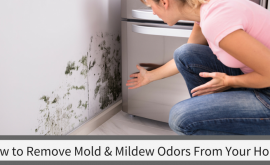 The smell associated with it is a musty odor that you are familiar with as the smell of mildew. If you happen to get a whiff of that smell you may want to examine the area closely; this is one of the biggest symptoms of mold in home! Are You Suffering From Allergies or an Allergy to Mold? Could It Be Toxic Mold Syndrome? Sneezing, coughing and the dreaded stuffy nose has hit you full force. It must be that time of year again, the time of year where allergies commence and you start feeling the effects instantly. Except, you have been dealing with these symptoms for quite a while, could it be something other than your allergies wreaking havoc? Could all these symptoms of mold in home be pointing at something more serious like Toxic Mold Syndrome? Mold in your home is a possible culprit of unwarranted allergy symptoms that are plaguing your health. When it is present in your home some people may start to develop an allergic reaction to the released spores in the air eliciting a reaction similar to those of allergies. If your supposed “allergies” have progressed over several seasons, you may consider an allergy to mold is happening to you. Many people consider seasonal allergies as there diagnoses because of the strong correlation between seasonal allergies and mold allergy, with symptoms such as sneezing, itching, runny nose, congestion, and dry, scaling skin. This is why it is important to learn how to detect symptoms of mold in your home and also not to dismiss symptoms of mold in home without investigating. However, when you are suffering from a specific mold allergy, you will have symptoms that can be a tad bit more severe due to the release of spores into the air that can then enter the air passageway, hence toxic mold syndrome. These spores that enter into the lungs can then trigger asthma-related symptoms. Sometimes, even, a mold allergy will have delayed symptoms leading to nasal congestion or worsening asthma over time. This is why detecting mold in your home is crucial to your and your family’s wellbeing! If you are experiencing any or multiple of these symptoms you may want to examine your home for potential mold outbreak that could be the cause of this allergic reaction. Never dismiss symptoms of mold in home as these can lead to serious long term health issues! Make sure to learn how to detect mold in your home to protect yourself and your family. The most impactful health issue when dealing with symptoms of mold in home is the dangerous spores in your indoor air. When you breathe in these spores that are in your air it can lead to severe health issues such as asthma and respiratory issues. 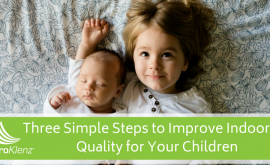 Treating your home’s air will help to reduce the levels of toxins and spores in your environment. The first step to do when dealing with any kind of mold issue in your home is to have a mold remediation specialist come to remove it from the environment. When you have it remediated from your home, however, the remaining spores get released into your home’s air and will contribute to health ailments. So how do you detect mold spores in your home and remove it from your air in the safest way possible? By utilizing an effective and high-quality UV air purifier in your home you can help to mitigate and destroy the spores circulating in your indoor air. The EnviroKlenz Mobile UV Model is a high-efficiency air purifier that utilizes ultraviolet germicidal radiation (UVC) lights to remove airborne particulates and allergens and hinder the growth of captured microorganisms such as bacteria, mold, and viruses. This UV air purifier provides a two-stage filtration process. First, with a patented earth mineral technology that is effective against noxious and toxic odors and chemicals through an “adsorptive neutralization” process. 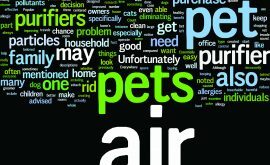 Then, with a hospital grade HEPA filter, that captures harmful dust, dander, particulates, and allergens from the air. The HEPA filter also collects the small mold spores from the air onto its filter, then the power of the UVC lights above the HEPA shine to kill them from the HEPA filter with a high efficiency of kill. This process is effective at eliminating trapped mold spores in your air and minimize your risk of toxic mold syndrome. Once you’ve learned how to detect mold in your home, it is all about learning how to treat it professionally and on your own. After you treat your air for released spores, the next step is to do a deep cleaning of potential toxins and chemicals stuck on the surfaces of your home. Check out this article on How to Prevent Mold Growth in a Poorly Ventilated Home to help you learn how to effectively clear your home of toxins. Hopefully, now you understand what toxic mold syndrome is, why not to ignore symptoms of mold in home, and what to do about it. 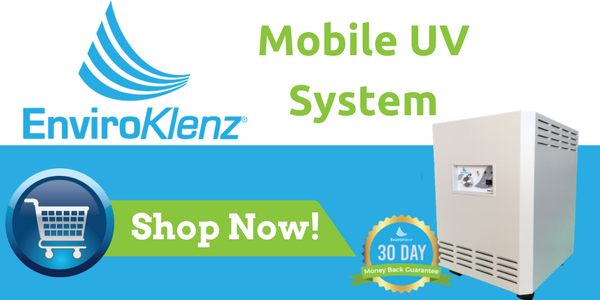 The EnviroKlenz Mobile UV System offers indoor air protection from potentially harmful spores that could be in your home’s air. Do you have symptoms of mold in home, actual mold in your home, or suffering from toxic mold syndrome? If you are suffering from toxic mold syndrome, the EnviroKlenz UV System can help! This system utilizes Ultraviolet Germicidal Radiation (UVC lights) to trap and kill mold spores that are in your indoor air. Breathe easier with this air purification system in your home! “It’s been a week since we have started using it. It makes the room air that previously had mold smell crisp and fresh and I feel better knowing that the spores are being destroyed with the UV bulbs”.